LG Optimus L7 is new android smartphone for middle class with luxury taste. Although less audible echo in Android phone competition, does not mean LG underestimated. Optimus at least through the presence of L7, LG wants to prove its existence. Previous South Korean manufacturer has also launched Optimus L3 is intended as an entry level smartphone. When looking at the specs and the price is priced approximately IDR 2.999 million, L7 is for the middle segment. Prior to the conclusion who needs LG Optimus L7. Check out what the real performance through the review below. Do not expect LG will stumble design issues such as 'brother', because that carried a very different design. Modern square style makes it comfortable to hold. Although it feels solid, the only slightly annoying, plastic, this phone feels like holding a toy cell phone. When traced further body LG L7 is, at the bottom there are three buttons for 'Home', 'Back' and 'Menu'. Very relieved with 4.3-inch landscape display, but fits in a pants pocket, because it has a 8.7mm thinness. Another is the volume button on the left, then the power button on the top right side with 3.5 mm head jack. While at the bottom is the microUSB port that serves as a data cable and charger. Conclusion This phone is very sturdy, slim and comfortable to grip even with one hand though. For those of you who have the fingers and palms are great. LG has the technology to display the so-called IPS-LCD. It is also embedded in the LG L7 is. When tested indoors or outdoors exposed to direct sunlight is able to show results that are not too good, but not so bad. This handset comes with a resolution of 480x800 pixels with a pixel density of 217ppi level. Expected minimum number of existing smartphone screen size. With this capability is sufficient for the needs of applications that do not require high graphics. Although it is somewhat regrettable that price, at least consumers can get better. One more weakness is not buried light sensor to automatically adjust the brightness - especially when outdoors. With a single core processor 1GHz Qualcomm MSM7227A dibesut through and Adreno 200 graphics processor paired with a suitable enough Android Ice Cream Sandwich plus luggage Optimus UI interface. From the test results with the benchmark Standard Quadrant obtained up to several times the number 1886. It's pretty smooth to run some applications that are not too heavy. But do not expect to be able to optimize such a faster dual core or multicore processors. Due to several cases, this handset has ngelag. LG pair the Optimus 5-megapixel camera on L7. Broadly speaking, it is not too bad to capture images with a low light situation because it has added an auto flash. When used outdoors was also able to record objects in detail, because the handset is also embedded autofocus feature to round up the picture with a close range. Besides the default application offered by LG is rich enough, one of which is the LG World. It is not much different from Play Store, but the application is suitable who wish to see the application of recommendation from LG. For support of it all, complete with the LG 1700 mAh battery. Been used continuously for gaming and other applications all day just to survive more than just a rechargeable battery. LG's big names and quality assurance in making devices at reasonable prices. With different designs, as well as the innards are implanted worth it if L7 is suitable for the first smartphone users. For products already have other LG home appliance, it is suitable when L7 is juxtaposed with these devices for the emergency multimedia player. Sony's increasingly aggressive in the world of Android. Vendors who recently split with Ericsson's handset continues menggeber new green robot. One of the best new is Xperia P. This handset will compete with other Android phones in the price range of $ 4 million. Japanese vendors that appear to be serious to create Xperia P. In addition to the design that looks attractive, jeroannya also qualified on paper with the presence of dual core processors. What kind of real performance Xperia P? Consider the following brief review. This phone is categorized as upper middle. The design is something like the Xperia S, handset Sony champ today. But size is slightly smaller. Yes, at first glance, the Xperia Xperia P and S as a twin. The most obvious similarity is that there are transparent at the bottom of the screen that emits light. But the smaller size of P Xperia. P Xperia body curved in the back that makes it ergonomic, feels solid in your hand. Does not feel slippery. P Xperia body looks premium because of the dominant use of metal. Solid and elegant design, it seems Xperia P is one handset that makes users confident to show off. There is little record of where the screen seems vulnerable Xperia P scratched. In testing, this handset to be treated carefully. But suddenly appeared a few small scratches on the screen is quite annoying. Xperia P around the body is decorated with various buttons and ports. As the camera button, USB port, HDMI, and of course the volume keys on the key off. Note again, it uses a micro SIM handset that may be quite a hassle because it has not been common. Additionally, the batteries can not be removed and no additional memory slot to add storage capacity. Xperia P equipped with a display technology called WhiteMagic. The technology is claimed to increase the clarity of the screen and helps make it more visible outdoors. And it looks like it is. An impressive display is one of the main strengths Xperia P. In addition WhiteMagic technology, was coupled with the Mobile Bravia Engine technology to improve its clarity. Screen resolution of 540x960 pixels Xperia P (QHD). The colors displayed on screen 4 inch handset looks natural. Clear in the eyes. When viewed outside the room was still quite comfortable. Xperia P still using the Android operating system Gingerbread promised 2.3 can be updated to Android 4.0. Sony provides its own custom interface in Xperia P with Timescape UI. Xperia icons and P looks elegant. There are five homescreen on the main screen that can be fitted with the menus as you wish users. There is a Folder Media is organizing a camera, music player and FM radio. It's visually very distinctive look and P Xperia attractive. Themes and wallpapers typical Sony Xperia series is quite interesting to use. There is a typical application Timescape organizing social networks like Facebook and Twitter. Components Xperia P is qualified, at least on paper. The handset uses a dual core processor 1GHz U8500 NovaThor by ST Ericsson and 1 GB of RAM. Theoretically, it should go smoothly operating cell phone. And rightly so. Although there is still a little lag symptoms, switching between screens and navigation menu running smoothly. Similarly, when accessing a variety of applications. For example, Gallery. photos and video are displayed quickly. To play the game also seems to be no problem. Testing is done with the game Grave Defense HD. Display the game feels very bright and pretty smooth operation. Although sometimes there are also non-responsive symptoms, although not to interfere. This handset has 16GB of internal storage that can not be expanded because there is no microSD slot. So users should limit the data in it so not too excessive. P Xperia cruising the Internet in support HSDPA up to 14.4 Mbps and HSUPA up to 5.76 Mbps. Browsing goes well, of course depends on the strength of the network operator is used. 8 megapixel camera is a mainstay on the Xperia P to take photos. Complete with flash lights to add quality images in dark environment situation. The resulting photos look rich detail and accurate colors. Shutter lag, or period of time from the camera to produce images taken of relatively minimal as well, so make comfortable. The handset is capable of taking full HD 1080p video. Good enough to replace the camcorder in recording a variety of precious moments. Music or video player has an attractive visual design. As usual, bursts of sound from the speakers is less presents an interesting audio experience. But if it is put on the headphones, then his voice was clear and kicking. To support its operations, equipped with a battery-powered Xperia P 1305 mAh. If used continuously, quite wasteful as well and only lasted about a day. Xperia P has a variety of advantages that make it be reckoned among the rows of the Android smartphone upper-middle class. Call it an impressive screen, good camera and a capable multimedia performance. Negative note pinned partly because the screen is easily scratched, there is no microSD slot and enough trouble for wearing a micro SIM. However, those who crave Android smartphone that could be accounted for by the quality most likely will not regret the choice Xperia P. This handset can be redeemed at the price range of IDR 4 million. Some time ago, the Samsung Galaxy S III belongs to a student reportedly burnt in Ireland. Samsung immediately to find out what causes it, and now the investigation has come out. South Korean manufacturer that states that aided investigations prove Investigations Fire agencies, the cause of the fire was not due to malfunctions of the handset. But the burning tereskpos 'an external energy source'. Samsung said they contacted the Fire Investigation based in the UK to investigate this case. The result, Galaxy S III burned by user error. "The only way to produce such damage is to put the phone in the microwave," said Samsung. The phone owners admitted that his previous Galaxy S III fell in the water. To dry it quickly, he put on a powerful heater. Well, that's the treatment that otherwise makes S III eventually burn. It is quoted by Reuters on Sunday (08/07/2012). Monitor devices designed by different hardware vendors featuring a variety of advantages, one of which offers advantages in terms of screen area. Some vendors provide special attention to not only offer a monitor with a screen size of the field to spoil the eyes of users, but also the features, specifications and completeness of the port located on the display device. ASUS is trying to present the newest line of products monitor, ASUS PA248Q ProArt series. The monitor has a fairly complete range of ports, such as four USB 3.0, HDMI, DVI and DisplayPort. In addition, the monitor is also designed with multiple joints that make it able to be rotated or tilted in all directions. Carrying 24-inch screen, the edges of the monitor is displaying as a ruler with inches, located on the horizontal and vertical on the screen. Monitor screen resolution 1920 x 1200 (16:10) with LED-backlit IPS technology panel is equipped with an earphone jack, and supports viewing of full high definition (HD), 480p, 576p, 720p, 1080i / p.
When Okezone tried to turn from the off position, the monitor with a weight of 6.4 kilograms featuring IPS panel technology with Viewing Angle (angle of view from the eye to the screen) to 178 degrees, only takes 5 seconds to the boot process it. Whole body monitor comes with an elegant black color, just at the edge of the bottom, just below the ASUS logo, there is a lengthening line of red. When viewed from the design and the completeness of its features that are ports on this monitor, ASUS targeting professionals who enjoy doing the activity image layout as well as photographers. However, a wide screen can be used also to increase the thrill when you watch movies or play games. This LCD monitor has a color reproduction that offers a 100% sRGB color sharpness quality IPS panel with A +, as well as some ASUS innovations such as features Quickfit, Splendid, 5-way navigation and the ability of the joints are designed to be able to move the screen in all directions. PA248Q can you position the screen down to the bottom or vice versa, with a tilt angle of 20 to minus 5 degrees. You can also rotate to the left or right with a limit of up to 60 degrees joints. In addition, the height of your monitor can also be positioned, with a range of up to 10 centimeters. In fact, this monitor is designed with a swivel joint which can tilt the screen up to 90 degrees. Thus, the previous screen in landscape position, a portrait. There are a number of buttons displayed on the bottom right of the monitor. Buttons, among others, Quickfit (5-way navigation), Menu, Shortcut 1 (OSD), Shortcut 2 (OSD), S / A to adjust the screen brightness as a standard mode, sRGB, Scenery, Theater, User Mode 1 and 2. Then under the S / A, there is a button that serves to switch from VGA, DVI, HDMI and DisplayPort. The power button is located at the bottom of the order that serves to turn on and turn off the monitor. PA248Q has four USB 3.0 that delivers fast data transfer capability of up to 10 times more than the USB 2.0 standard. To use a USB 3.0 port, you must install the USB upstream end of the wire the smaller (type B), to the upstream USB port on the monitor, then the larger end (type A), into the USB port on the computer. This monitor also has an earphone socket, but has no speaker output to the built-in. Thus, the required external speakers (headphones or speaker set). To use the earphones, only when HDMI or DisplayPort connection: connect the earphone jack connector end into the monitor. ProArt PA248Q ASUS Smart Contrast Ratio feature 80 million: 1 and brightness of 300cd/m2, so the monitor is capable of measuring the suitability of darkness backlight to get black and white Brightest. With these features, monitor capable of displaying the best contrast and sharpness of detail. In addition, Ultra-Smooth feature embedded Visuals can also provide ultra-smooth visuals with a response time of 6ms (GTG), in order to experience when watching movies or playing games do not experience lag (dashed), and displays full graphic detail and color more original. PA248Q also equipped with Customized Color Adjustment feature, which allows control of hue and saturation by setting six colors, namely red, green, blue, cyan, magenta and yellow. Not only that, Picture-in-Picture (PIP) and Picture-by-Picture (PBP) owned this monitor allows users to view images from different signals. While for the feature QuickFit Virtual Function Scale, allowing you to see the preview image or document on the screen with the actual size. Preview format to support, among others, document: A4 and Letter. Photo: 8 "x10", 5 "x7", 4 "x6", 3 "x5", 2 "x2", and the Grid: inches, centimeters, and alignment. Monitor the size of the big screen has always been the top choice to get the best experience of computer use. Especially on ASUS PA248Q, this monitor not only displays the display size of 24 inches, but is also equipped with the technology and features embedded in it. The use of in a long time (staring into the screen), nor does it make your eyes get tired, because the size of the width of the screen that carried it, displaying text and images with a size that can be maximized as well. Besides setting the brightness mode PA248Q level can be adjusted easily through the S / A. Supports a variety of jobs and activities in front of your Personal Computer, ASUS PA248Q could be the right choice for professionals and for those who like to play games and watch movies / videos. Matter of price, official website for the Idealo display monitor ASUS PA248Q worth 381.59 pounds or approximately Rp 5, 4 million. Facebook appointed Sheryl Sandberg as a director. Sheryl currently serves as Chief Operating Officer becomes first woman on the board of directors before coming up which consisted of seven men. The appointment of women as directors quite rare in the United States technology companies or the comparison too far with the number of male directors. So that the appointment of Sandberg welcomed by the business community there. Join on Facebook since 2008, Sheryl became an important figure in the world's most popular networking site. Graduate of Harvard Business School has become a key figure in the future of Facebook is now getting into the stock market. Last year, Sheryl has been named by Forbes magazine as the fifth most powerful woman in the world. Even so busy with business affairs at Facebook, Sheryl still have time to raise two children with her husband. "Sheryl has become my partner in running up and became a central figure in the growth and success in recent years. His experience in public company up and make it fit on our board," said Zuckerberg was quoted by Reuters on Tuesday (26/06/2012). Prior to working at Facebook, Sandberg was Vice President of Online Sales Google. In this online search engine giant, beautiful women also excel in making money from advertising. Game players are capable of triggering diverse reactions. Feel proud when successfully defended the fort with his adrenaline racing, or maybe when racing at high speed. However, nothing is able to provoke emotion as powerful as a horror game. Have hair-raising goose bumps when you play the game? Or maybe feel something moving behind you? All that can happen when playing a horror game. Here are the five most terrifying game that is sure to be able to challenge your courage. If you think Resident Evil movie, starring Milla Jovovich has been terrible, do not let you play this game. Called a survival horror game is able to make the players are always alert. When you feel safe walking the halls, zombie dogs jumped through the glass and pounce on you! Many gamers who claim to spontaneously throw their PlayStation controller when the dog appears. At first this game looks like a regular shooter action game. The enemy came and bullets flying. However, it is not mistaken for a shadow flashed past the hallway in front of you. When you get there, but to no one. When you look back, a bloody girl pounce on you! This is a psychological horror owned this game. Throughout the game you will continue to be haunted by the "appearances" terrifying. Silent Hill movie ever produced by Hoywood can not compare this game is terrible. When you are in the middle of a thick fog covered the dead and the only sign of any enemy near your radio is the voice distortion, would you calm? Frankly, the voice that just made it even more terrifying! Not to mention the sound of sirens that turns into bloody city! Imagine yourself in a remote village untouched by technology. No vehicles, road asphalt, and even electricity. Later, the village was hit by the curse that makes the ghost haunts. That's what happens in Fatal Frame II. You will pass a full night of horror through the eyes of a little girl named Mio. He could not kill a ghost with any weapon except an old camera. Yes, old cameras. Mio have photographed a ghost to go away. Sounds funny? You would not think so when playing it straight. Horror game above all have one thing in common - the enemy can be attacked with weapons. Unfortunately, not so with Amnesia. This game does not give you any one weapon to defend yourself! You only have one lantern that illuminates the area around it. More horrible yet, you're always being chased by something bloodthirsty. Darkness, helplessness, terror, and a tense voice will continue to follow your journey. Many gamers who give up on the road as a result can not stand playing with gripping horror continues. BlackBerry 10 comes without physical keyboard. Research in Motion (RIM) BlackBerry as the producer explained that the first device with the BlackBerry operating system 10 (BB 10) will be present without physical buttons. As quoted from CBC News, Rebecca Freiburger RIM spokesman confirms that the BB device 10 will not have a physical QWERTY keypad. But in the future, RIM will continue to maintain the BB device 10 with the physical keyboard. "We are prioritizing the virtual QWERTY keypad. But we also will not leave a physical QWERTY keypad which is now known by the public," says Freiburger. RIM CEO Thorsten Heins has also been explained at a press conference in Orlando last month that RIM will not abandon the popularity of the physical keyboard. BlackBerry manufacturer is currently preparing a BB device 10 to be released later this year, although no launch schedule. The news about RIM will continue to maintain a physical QWERTY keyboard has also been described by the Senior Manager of Content Strategy South East Asia RIM Ben Gillenwater. The reason is simple, physical Qwerty keypad on the BlackBerry device is still in demand by the market. Sources of News For BlackBerry (N4BB) has received word that the BlackBerry device will be given 10 BB OS will first be released in early September 2012. The plan, a device with virtual QWERTY BlackBerry will be named Nevada. Previously, we had mentioned that BB devices with OS 10 is the first BlackBerry London. But until now also no news yet again. Currently, BlackBerry Nevada reportedly is in final production stages. That is, for BlackBerry fans who like the physical QWERTY keypad, the device with the latest BB OS 10 will be present soon after the inaugural BB 10 was released. Operating system Windows Phone 8 (WP8) will have a core program (kernel) is equal to 8 for Windows desktop and tablet computers. The goal is to unite the Windows operating system franchise of any type of device. That way, users can have the choice of device (smartphone, tablet) are more numerous and can more easily use the same application on several different devices. Microsoft hopes to use the same core program of the Windows operating system on desktop computers, smartphones, and tablet will facilitate developers in creating applications that can run on any platform with minimal adjustments apply. The move is intended as a strategy in the face of IOS and the Android platform is more mature in the mobile device industry. 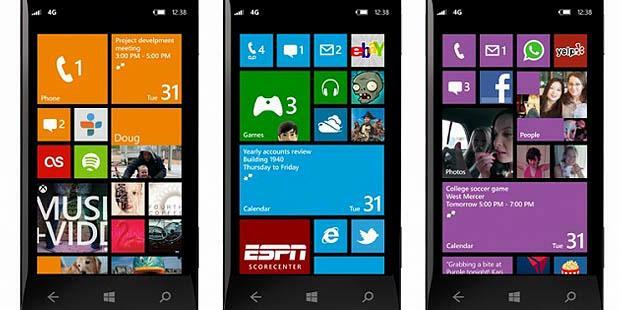 Wednesday (6/20/2012) yesterday, Windows Phone 8 for smartphone has been officially announced by Microsoft. The operating system uses the user interface "Metro" is the same as the desktop version of Windows 8 and tablet. Windows 8 desktop version will be released in October. Microsoft has invested billions of dollars-including cooperation agreements with Nokia, the world's efforts to penetrate the smartphone market. Until now, Microsoft has managed to grab global market share by 2 percent, compared to Android which has a mastery of 56 percent and Apple with 23 percent.